Bogota, Aug 16 (IANS) Colombian President Juan Manuel Santos oversaw the final withdrawal of weapons handed over by the Revolutionary Armed Forces of Colombia (FARC) rebels, the media reported on Wednesday. At a ceremony in Fonseca, a town in the northern province of Guajira, Santos on Tuesday said the shipment marked “the last breath of the conflict” between the rebels and government forces, which lasted 53 years, Xinhua news agency reported. “With this disarmament (the withdrawal) of the last containers, the conflict truly ends and a new phase begins in the life of our nation,” Santos said. The President was accompanied by the head of the UN mission in Colombia, Jean Arnault, as well as FARC representatives. “Eight months after signing an (peace) agreement, we are witnessing the conclusion of the disarmament,” Santos said, adding the process was carried out in a “record time”. 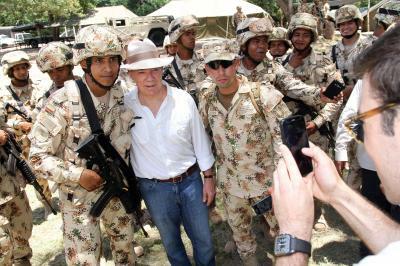 Arnault said the FARC had been completely disarmed. The UN mission has withdrawn 8,112 pieces of weapons and nearly 1.3 million cartridges of ammunition from the rebels and then incinerated them. The operation also involved extracting thousands of other weapons and munitions from FARC camps and hideouts, including more than 22 tonnes of explosives, 1,846 anti-personnel mines and 3,957 hand grenades. Arnault echoed Santos’ words, saying the “exhaustive process” of disarming the rebels marked a new era. “We are going to be able to develop zones that were never developed,” Santos said, referring to former rebel-held territories. As part of the peace agreement signed by Santos and FARC leader Rodrigo Londono, known as Timochenko, in November 2016, the government has pledged to invest in the country’s agricultural sector and carry out land reforms.